New Post Up at Grounded Parents! What's That Sound I Hear? Tumbrels Drawing Near? It's come to my attention that not all of y'all are watching Justified, which -- while in the first season it had kind of a slow start -- has over the past few years become one of the best shows on TV. Last week's episode had just a great moment where Boyd Crowder (who arguably has become the show's main character) and Tim Gutterson (a favorite of mine) got left to wait in Boyd's bar while Raylan Givens went to check out a lead Boyd had given up. When we come back, Tim and Boyd are playing Scrabble. Which is -- it's just perfect. It's moments like that which make me love this show so much. Plus now I just can't stop wondering: who was winning? Because Boyd has a vocabulary that won't quit, and he's a master of strategy. But Tim reads endlessly, and also he's a sniper, so good at gaming a field. Yeah. I just don't know. Mind you, Cheerios is pretty much the only cold cereal we eat anyway, since all the others contain corn syrup, which the kid is allergic too. But if we didn't, we would now. I also like that this is a portrayal of a young girl negotiating with her parents and getting what she asks for. Cool, tough girl child, in other words. Very nice. 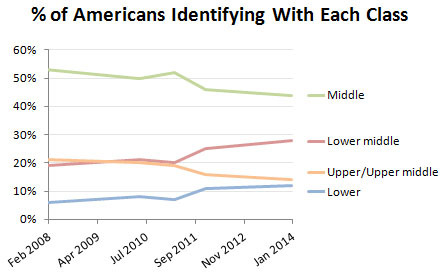 Over at Mother Jones, Kevin Drum takes note of a recent Pew Research poll which finds that increasing numbers of Americans classify themselves as poor or lower-middle class. As Drum notes, this news is even worse than it seems, since Americans have always been and continue to be reluctant to call themselves anything but middle-class. To find this many of us willing to call ourselves lower-class or even lower-middle-class speaks to the dismal State of the Union indeed. Or maybe just -- finally? -- an awakening to reality? New post up at Cooking With Delagar for this cold weather. Go here to read it: Barley Soup. Also! Ganstagrass has a new album out: Broken Hearts and Stolen Money. Update: a review of Broken Hearts. I'm listening to the album right now, while editing for CG, & loving it. I've been nominated for an award. But the stacks of paperwork required to support my nomination -- ai. Also it's supposed to snow here tonight. Also I got dogged by contentious commentators over at Grounded Parents yesterday. Theoretically, this is a good thing, since contention brings the page views. In fact, though -- ai. Also I am teaching Jane Eyre this week. Go here to read it: Against Marriage. Here in Arkansas, we do (finally) at my university get Martin Luther King off as a paid holiday. When I first arrived here, we did not. I forget what excuse the university used -- that we got Veterans day off instead, I think, or that we got the Friday after Thanksgiving off instead, or who knew what. But everyone knew the real reason, which was that this is the South, and we don't celebrate that man. Well, now we do. Statewide, not just at the universities. But -- to keep the haters happy I assume -- this is not just Martin Luther King day, here in Arkansas: it is also Robert E. Lee Day. Yeah. We celebrate, here in Arkansas, on the same day, Martin Luther King, Jr, and the leader of the Confederate Army: the man who took up arms against his country in defense of slavery. Boo-Yah. So, to take the taste of that out of my mouth, I bring you this, from over at Daily Kos: an essay on the importance of what Martin Luther King did. If you don't read anything else today, you should read this. "I'm guessing that most of you, especially those having come fresh from seeing "The Help," may not understand what this was all about. But living in the south (and in parts of the mid west and in many ghettos of the north) was living under terrorism. "It wasn't that black people had to use a separate drinking fountain or couldn't sit at lunch counters, or had to sit in the back of the bus. "You really must disabuse yourself of this idea. Lunch counters and buses were crucial symbolic planes of struggle that the civil rights movement decided to use to dramatize the issue, but the main suffering in the south did not come from our inability to drink from the same fountain, ride in the front of the bus or eat lunch at Woolworth's. "It was that white people, mostly white men, occasionally went berserk, and grabbed random black people, usually men, and lynched them. You all know about lynching. But you may forget or not know that white people also randomly beat black people, and the black people could not fight back, for fear of even worse punishment. "This constant low level dread of atavistic violence is what kept the system running. It made life miserable, stressful and terrifying for black people." 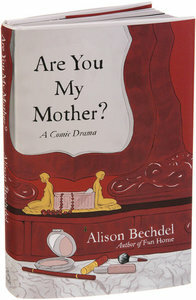 Here is why I wish we were allowed to order books for classes at the last minute: I would love to use Alison Bechdel's Are You My Mother in the Women's World Lit class I am currently teaching. Sadly, I did not get around to reading the novel until a few weeks ago, and our book orders (for this semester) had to be turned in last September. Well, maybe I can use it in a future class. It's just excellent. Like Bechdel's other most famous work, Fun Home, which is the story of her father's suicide, Are You My Mother? is an autobiographical graphic novel. I think it's much the better book, however. It's complicated and complex, a very meta work (as the text itself admits), filled with both literary and psychological allusions; mainly, though, it deals with the erasure of women from our own history, from our own field of vision: the way, because our mothers don't see us, we cannot see ourselves (cannot allow ourselves to see ourselves) and how this blindness is passed on, generationally, mother to daughter, like an genetic illness, or a curse. I've stated very clinically there what Bechdel transmit beautifully, through story and art. I urge you to ignore my clinical description and read her novel, which I love to bits. Did y'all know about this site? If you lose your cell phone -- like in your house -- it calls your phone for you and makes it ring so you can find it. I mean, not that this ever happens to anyone I know personally. Over at Grounded Parents, my new post is up, y'all. Read it here: Wearing All The Colors. When I was a kid, Sunday afternoon was the saddest phrase in the phrasebook. Because back to school on Monday was right there. Unless you hated school quite as much as I did, you probably don't share the visceral dread of Sunday afternoon and evening I still (to this day) get. It's a nice afternoon here, sunny and not too cold. I opened the window for the cats and I've been working steadily away on my novel and on prepping for my SF workshop (I am finally teaching a SF workshop this semester). Plus also the semester ahead looks almost pleasant: I am teaching only three classes, all of them excellent classes. (1) Grammar (2) Women's World Literature (3) SF Workshop. AND I have T/R off for writing purposes. Partly school was so awful for me as a kid because I went to terrible schools. Partly it was so awful because I was nearly blind as a child, and no one noticed until I was eleven or twelve -- I literally couldn't see more than a foot or so away; my memories of my teachers and classmates are of pale smears. When my teachers wrote on the board, I saw nothing at all. Partly it was because the work they gave me to do at the desk was so amazingly tedious. I remember stapled together packets of worksheets that were 10 or fifteen pages thick. I don't know if this memory is accurate, but I do remember just not doing them. These were analogy worksheets, "Fish is pond to flower is to ____"
Anyway. My point. Do I have one? I think I am just attempting to examine why I feel so gloomy right now. Though I might be thinking about the lifelong damage that a terrible education system can do to Your Tender Child.